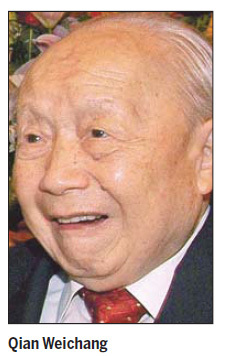 SHANGHAI - Renowned Chinese scientist Qian Weichang died here on Friday morning, saddening millions of his countrymen. Qian, a pioneer in mechanics and applied mathematics in modern China, was one of the three famous "Qians" in China's science and technology field. He was well known alongside Qian Xuesen, the father of China's space program, and Qian Sanqiang, a nuclear physicist who oversaw the development of China's nuclear program. Wu Shuqing, former president of Peking University, said Qian was an internationally acclaimed scholar whose modesty and conduct has set a good example for following generations. After learning about Qian's death - a man widely acclaimed as one of China's greatest intellectuals - millions of Chinese people spontaneously paid tribute by offering condolences online. Many students from Shanghai University, where Qian was a former president, burst into tears after hearing the news, saying it was a great loss to the university and to China. For those off campus for the summer vacation, many visited their university website, which had been turned gray in tribute. Some said they planned to return to the campus to mourn him. Many of those still on campus spontaneously joined preparations for a mourning service that will begin at the university on Saturday. The university has set up two mourning halls at two of its campuses and publicized the mourning time and phone numbers at the two sites. Qian was born in Wuxi, in eastern China's Jiangsu province, in 1912. Although he was initially not good at science, he chose to study physics at Tsinghua University because he believed science and technology were the keys to revitalizing China in the 1930s. He graduated from Tsinghua in 1935, and earned his PhD in applied mathematics from the University of Toronto in Canada in 1942. He returned to China in 1946 and became a mechanics professor and later vice-president at Tsinghua University. Qian made great contributions to the engineering applications of sciences, such as the fluttering of airplanes, the design of submarines, armor penetration, the design of instruments and pipe systems. He is an academician of the Chinese Academy of Sciences.